Organize or find your essential oils easily without having to look at the front of each bottle! 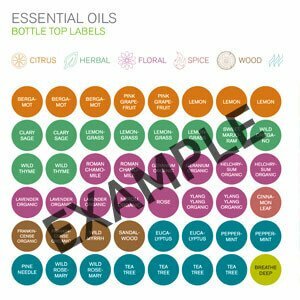 Our new bottle-top labels make finding the essential oil you need fast and simple. Each label is color coded by scent family:Citrus, Herbal, Floral, Spice, Wood, Cool and Blends. We have also included tester labels and blank labels so you can label your own unique creations. Each 8 ½ x 11 sheet holds 132 round sticker labels. Sold in a package of two and shrink wrapped for protection.